Sorry for the late WrestleMania review. I was a little under the weather this past week. I also needed time to process this event. It wasn’t a bad show by any means, however, it also wasn’t the grand slam event that it could have been. Besides the super-hyped and unexpected return of Shane McMahon, the show had a lackluster build up over the past five weeks. AT&T Stadium in Arlington, Texas was the setting for this year’s lineup of 11 matches, all with the design to break WWE’s all-time attendance record. Zack Ryder was popular a few years ago, no thanks to the company. Then his star faded and it appeared he would never reach any level of prominence ever again. Winning the IC title at WrestleMania is a pretty cool accomplishment, however, Ryder was such a non-factor on television that I didn’t pay attention to anything he did in the match. This moment could have catapulted Ryder to a second round with stardom. Unfortunately, he was keeping the belt warm for The Miz who bested him for the title the next night on Raw, which turned a great match into a hollow story with a pseudo-ending. If you believe on any level that Chris Jericho buried AJ Styles because he pinned him in the middle of the ring………STOP IT! This is a story in progress where two of the best wrestlers in the world are now tied with two wins a piece in singles competition. AJ Styles has been attached to the hip of Chris Jericho since he arrived in WWE as this pairing has a higher design. Styles was booked to work a program with Jericho to learn the WWE style of working at a slower pace and making everything count for the camera with an emphasis of entertainment over wrestling. While the match didn’t have Jericho’s normal in-ring fluidity, the 17-minute affair kept fans on the edge of their seats. AJ hit the Styles Clash after online rumors surfaced that Vince McMahon legitimately banned the maneuver. Jericho came away victorious after catching Styles coming off the top rope with his patented Code Breaker, and now there is an inevitable fifth bout on the horizon to look forward to. The League of Nations defeated The New Day when Sheamus pinned Xavier Woods after hitting him with the Brogue Kick. The purpose of this match was merely a setup for the arrival of Shawn Michaels, Mick Foley and Stone Cold Steve Austin after the League said they were the best three-match team in history. The three Hall of Famers cleared the ring of both teams, and Austin even did a little celebratory dance with Woods before nailing him with a Stone Cold Stunner. This got the biggest reaction of the night as a customary beer bash ensued. Brock Lesnar pinned Dean Ambrose in a No Holds Barred Street Fight after drilling him with an F-5 onto a steel chair. Weapons, chairs, and 13 German suplexes from Lesnar highlighted a fun affair. In the end, Ambrose, who is legitimately WWE’s most popular wrestler, didn’t come off looking any stronger as the idea of Ambrose making Lesnar feel out of his element in a weapons filled match never resonated. 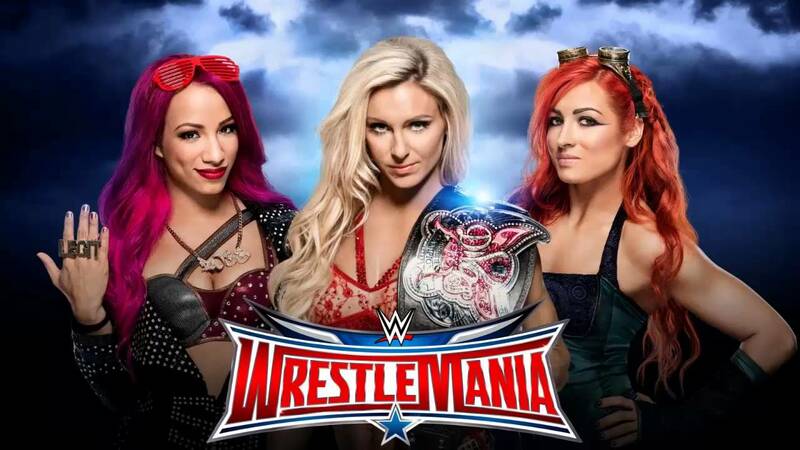 Divas Champion Charlotte defeated Becky Lynch and Sasha Banks to become the new WWE Women’s champion. No, that was no type-o. WWE has finally cast aside the term Diva and are not using that to refer to their female wrestlers “Superstars” thus putting them on equal footing with the men from a branding perspective. Plus, they finally got rid of that damn Butterfly belt. These ladies wrestled bell to bell for sixteen minutes in a great match that stole the show in what could very well be the greatest female wrestling match to ever occur on the main roster. Charlotte won after making Becky Lynch submit with the Figure Eight while her father, Ric Flair, prevented Sasha Banks from breaking up the maneuver. This match had all the hype in the world once Shane McMahon returned to WWE several weeks ago, and ever since, the match lost a bit of steam due to how the creative team wrote and executed the story. When the bell rang, there really wasn’t much to the match. In fact, it was hard to believe that Shane McMahon could go toe to toe with the Undertaker. Once Shane jumped off the top of the cell with an elbow drop through a table where Undertaker moved out of the way, it was clear that the entire match was building to that stunt. They worked hard, but the match was too long and it didn’t click, which is just another in a long line of angles where WWE starts something off really hot, only to fizzle right before the finish line. Every time I see Shaquille O’Neal, it reminds me of how badly I wanted the Shaq-Fu video game for Christmas one year, only to be thankful it wasn’t under my tree when I learned how bad it was. The former NBA MVP was a surprise entrant into the battle royal along with former WCW champion Diamond Dallas Page and early WWF 90’s star Tatanka. Baron Corbin was an unannounced entrant and ended up winning the match. It was cool to see someone from NXT debut at WrestleMania, but the spontaneous nature of it all telegraphed the finish. Plus, Corbin is good, but there are better wrestlers who could have been chosen for this spot. Plus, if WWE failed to make Cesaro relevant with this match, how the hell are they going to archive the same thing with a wrestler that nobody knows and has half the talent? I’m not disappointed that Roman Reigns won or that he didn’t turn heel or any of that other stuff. Its that WWE did nothing creative with that match, nor did they try to. The only thing Vince McMahon cared about or wanted out of this match was for Reigns to get the 1, 2, and 3 in the middle of the ring. It not only showed, but the match suffered because of it. WWE kingpin Vince McMahon has been labeled as an out of touch old man who no longer his creative mojo. Based on how the event unfolded, however, there doesn’t appear to be a drought of ingenuity but rather a pause on engaging content. Wrestling is an adventurous escape from the real world without making the consumer analyze every facet of the show. While there are many fans who want more thought-provoking material, a legitimate record-breaking crowd of 97,769 people filled AT&T Stadium to witness the spectacle of WrestleMania. WWE is simply selling spectacle of pro wrestling, Micheal Bay style, minus the explosions. I’m not calling fans who enjoy the current product dumb or less enlightened in any way, I’m just stating the obvious that for all criticism by pundits, bloggers, and die-hard fans, WWE is pretty much thriving in time where wrestling isn’t cool. Overall, WrestleMania 32 was an entertaining show that didn’t dare to break any new ground in the storytelling department.